Another important fact: You can start receiving your retirement benefits as early as age 62, and your spouse can also receive benefits based on the worker’s earnings history. Furthermore, a spouse can get up to half (50%) of the worker’s full retirement benefit, though it may be reduced if the spouse has not reached his or her FRA (full retirement age). But, and this is also very important, the spouse’s worker must have filed for benefits. Here’s another rather “interesting” fact: if you are divorced, a spouse can get Social Security benefits even if his or her ex- has not retired! You must have been married for at least ten (10) years, not have remarried, and be at least 62 years of age. Your ex- must also be at least 62. Furthermore, any benefits you receive from your ex’s Social Security do NOT impact the benefits your ex’s new spouse! Now, here’s one of those facts that most people don’t know about: if you choose to retire early, you will experience a PERMANENT reduction in your Social Security benefits from that which you would have received at your FRA. IS IT POSSIBLE TO EXPERIENCE A REDUCTION OF MY BENEFITS? The simple answer is “yes,” but that’s really not the full answer. Here we go: if you are younger than your FRA and if you earn more money than that which is listed on Social Security tables, you may experience a reduction in benefits. If you file for early retirement, the Social Security Administration will reduce your benefits by five ninths of one percent (5/9ths of 1%) each month for the first thirty-six (36) months PLUS five twelfths of one percent (5/12ths of 1%) for the remaining period until you reach that magical FRA! For example, at age 62, you would experience a PERMANENT reduction of benefits of 25%! That’s another big ouch. 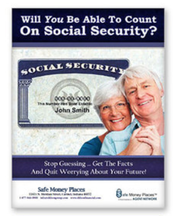 Beginning in the month of your FRA, you can earn an unlimited amount with no reduction in your Social Security benefits. Now, there is an important distinction here: “earned income” is money you receive from working (your salary, wages, commission, etc.). Any money you receive in interest earnings, capital gains, pension, and annuity income, however, are considered “unearned” and will not cause a reduction of benefits. Benefits withheld BEFORE your full retirement age are recaptured starting at full retirement age, resulting in higher monthly benefits later.